The earliest known photograph of Radcliffe Bridge district, taken by William Smith in 1854. The belfry of the original St Thomas' Church is visible on the horizon. 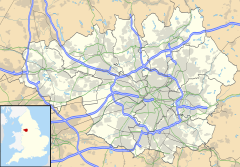 This page is based on the Wikipedia article Radcliffe, Greater Manchester; it is used under the Creative Commons Attribution-ShareAlike 3.0 Unported License (CC-BY-SA). You may redistribute it, verbatim or modified, providing that you comply with the terms of the CC-BY-SA.